The 65th anniversary of Independence and the first in a series of events to celebrate 60 years of Diplomatic Relations between Sri Lanka and Indonesia was celebrated at the Sri Lankan embassy in Jakarta. 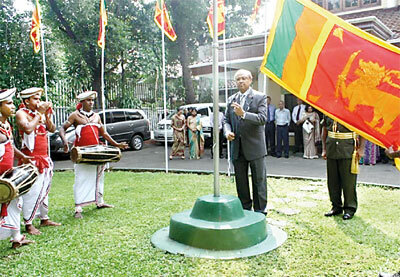 Ambassador Maj. Gen (Retd) Nanda Mallawaarachchi hoisted the National flag to the beating of the Magul Bera at the Chancery premises. The Sri Lankan community in Indonesia all of whom are members of the Association of Sri Lankans in Indonesia joined the Ambassador along with members of the embassy staff and their famillies for the ceremony. After the lighting of the traditional oil lamp by the participants, two minutes silence was observed to pay tribute to National Heroes. Religious leaders representing all the major faiths prayed for blessings on the country and its people. Minister W.M.S. Bandara gave the welcome address and the Ambassador in his address highlighted the massive development initiatives undertaken by the Government of Sri Lanka under the leadership of President Mahinda Rajapaksa fostering national unity. Thereafter Independence messages from the President, Prime Minister and Minister of External Affairs were read. After the vote of thanks, all participants were invited for traditional tea consisting of Sri Lankan sweetmeats.�An evening reception and cultural show held at the Usmar Ismail Hall was attended by high ranking Indonesian government officials, diplomats and other distinguished invitees. Sri Lankan carrier Mihin Lanka ltd based in Jakarta made use of this event to promote Sri Lanka as the best tourist destination in the region and conducted a marketing activity parallel to the event.